Sources said that the BJP leaders had brought to the notice of the party high command simmering anger among the upper castes in a number of states. 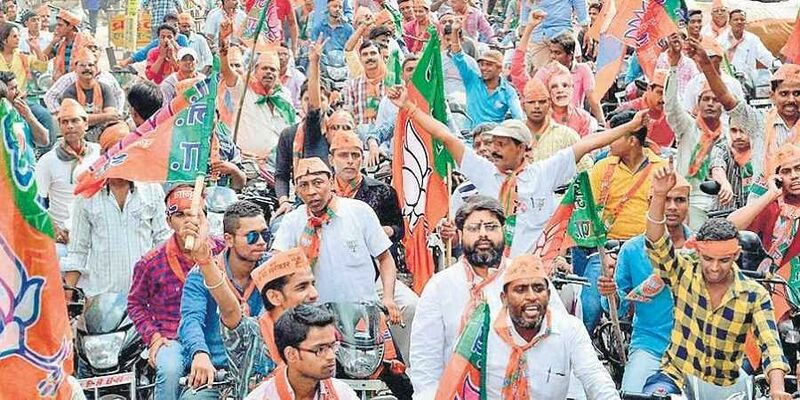 NEW DELHI: The BJP’s determined bid to build new constituencies among Dalits and other backward castes (OBCs) appears to have unnerved the party’s traditional support base amongst the upper castes, who seemingly have begun giving warning signals in poll-bound Madhya Pradesh and Rajasthan. The BJP leaders in the two states have apparently noted anguish among the upper castes, with alarm over the Narendra Modi government enacting an amended law for prevention of atrocities against members of scheduled castes and tribes to overturn a Supreme Court verdict, and the saffron outfit going the extra mile to give representation to Dalits and OBCs in appointment of governors and nominations to the Rajya Sabha. “The BJP campaigners in Madhya Pradesh, including Union ministers and prominent party leaders, have been confronted with an angry backlash from crowds on campaign trails. People from upper castes lament that their support to the BJP has been taken for granted,” said a BJP functionary, who added that the manner in which the Modi government had overturned the Supreme Court verdict on the SC/ST Act had caused anger in the party’s traditional support base. Sources said that the BJP leaders had brought to the notice of the party high command simmering anger among the upper castes in a number of states. “From picking new governors and nominees for the Rajya Sabha and legislative councils in a few states, the BJP has shown aggressive preference for OBCs and Dalits. Besides, the decision to count the OBC population in the 2021 census is being seen among the upper castes as another attempt to broaden the contour of reservation, which could hurt their interests,” sources added. The Modi government’s push for reservation in promotions for SC/ST employees has also seemingly angered the BJP’s traditional support base, sources added. “For the past couple of years, the BJP has stayed the course to build new electoral constituencies among Dalits and OBCs. It was incumbent on the party to beat the strategies of its rivals, who are keen to pool their support bases to counter the BJP. However, the party couldn’t provide the required cushion to the upper castes,” said a BJP leader.